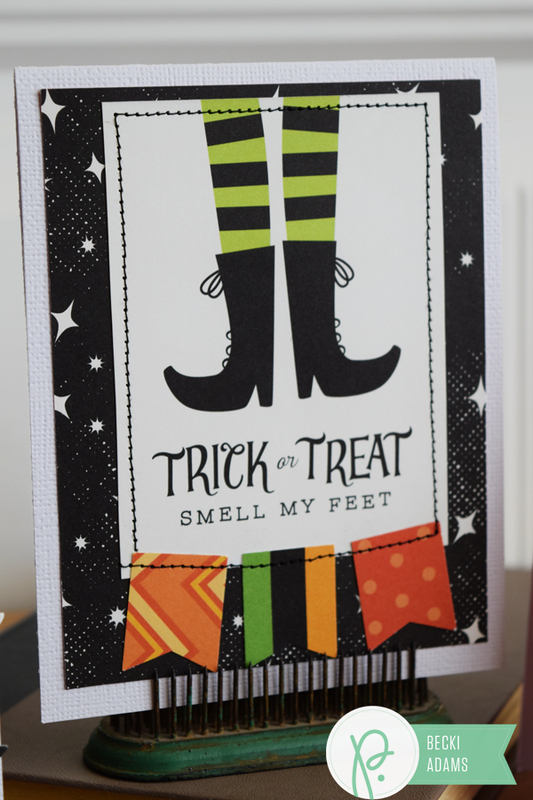 October 2015 - Pebbles, Inc.
Hello Pebbles fans! 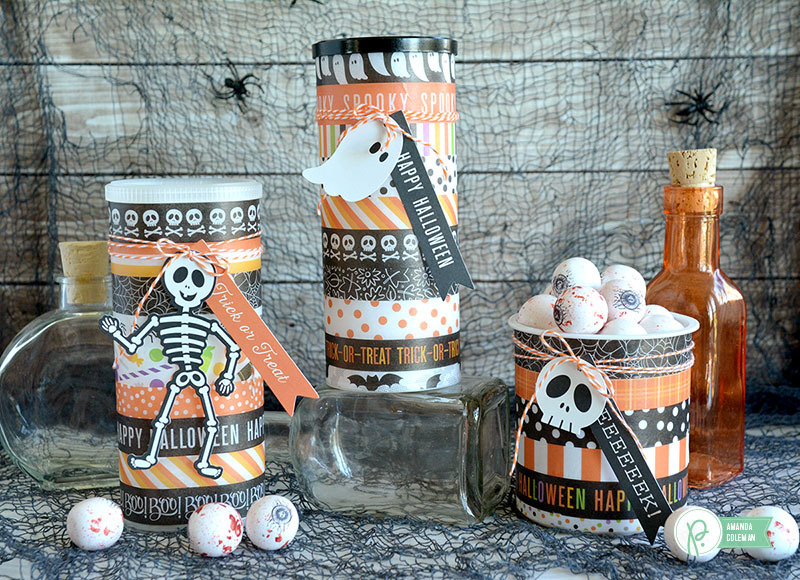 Eva Pizarro here today bringing you a halloween decor for your front door. In Chile we are just starting to celebrate this holiday. I live in the suburbs and here there are a lot of children who dress up and knock our door asking for treat or trick. This year I decided to decorate our front door a little to let them know they are welcome and that we have candy! 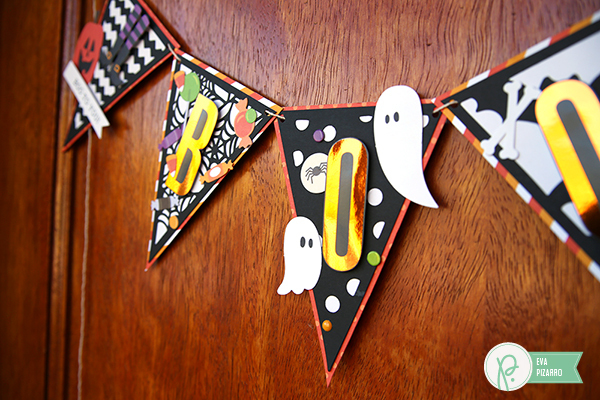 To start this banner I used my Minc machine to laminate the “Boo!” word with an orange foil. 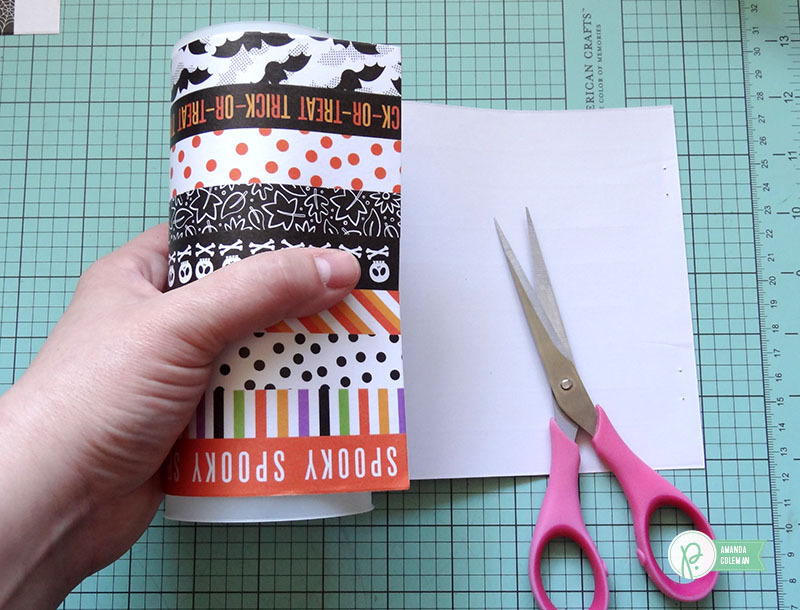 Pebbles has many embellishments that you can laminate to customize your supplies, here I am using the subway art that comes with other posters but you could also use a laser printer and print your own word. 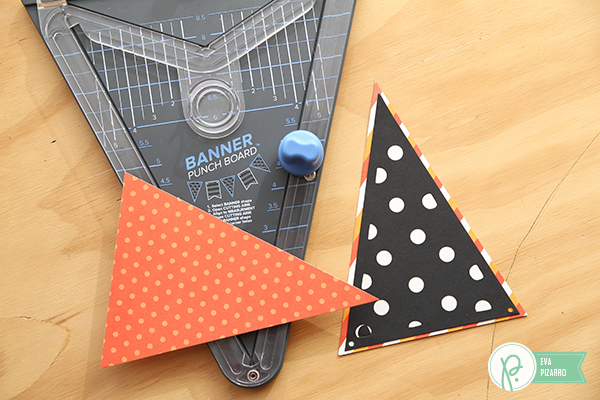 Use your Banner Punch Board to cut triangles a bit larger that the ones that come with the pre-made banner kit. Mat all your tringles and arrange them mixing patterns. 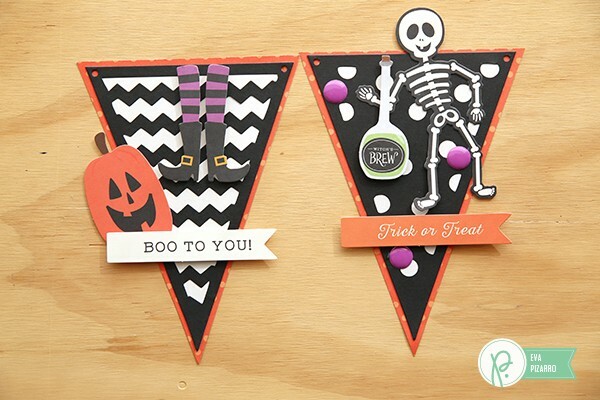 Embellish your triangles, I decorated two of them with a few die cuts from the “Chips” package. And used the other ones to put my letters. 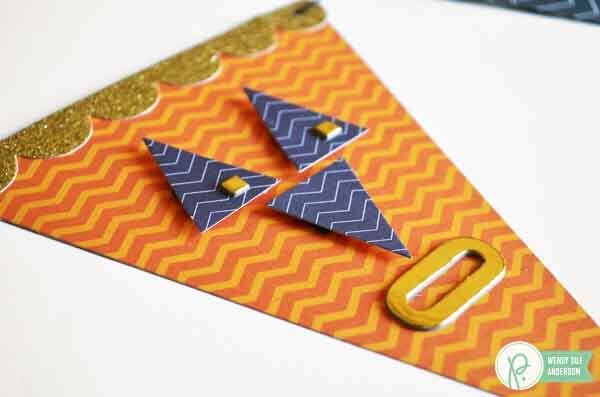 I also decorated these triangles with die cuts and some enamel dots. 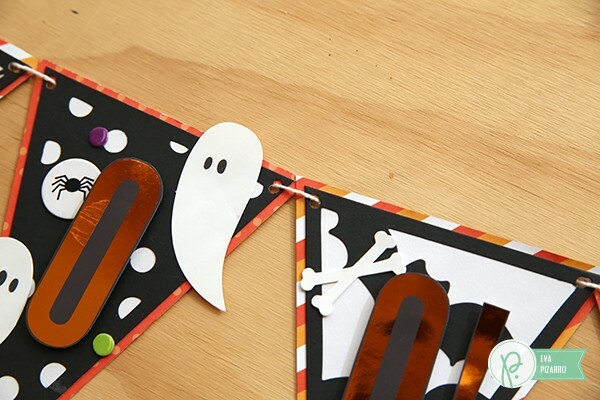 Use the hole punch in your Banner Punch Board to make the holes in your banner and pass a string to create your banner. To cover the nails on my door I used this cute bat clothespin. And this is the complete banner! 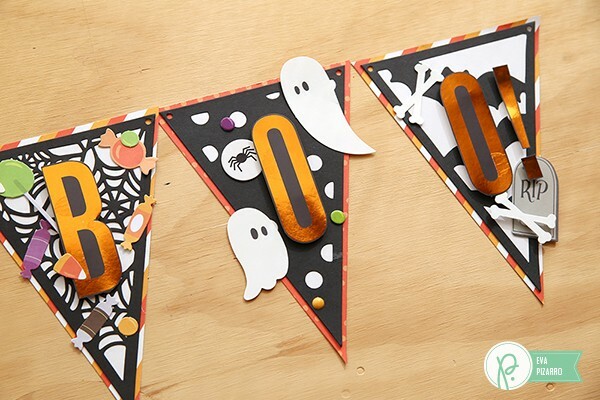 I love how the laminated letters shine and those ghosts are the cutest! I hope that this simple decor can make the kids feel welcome! And the best part is that you can fold it and have it ready for next year! Do you love banners? 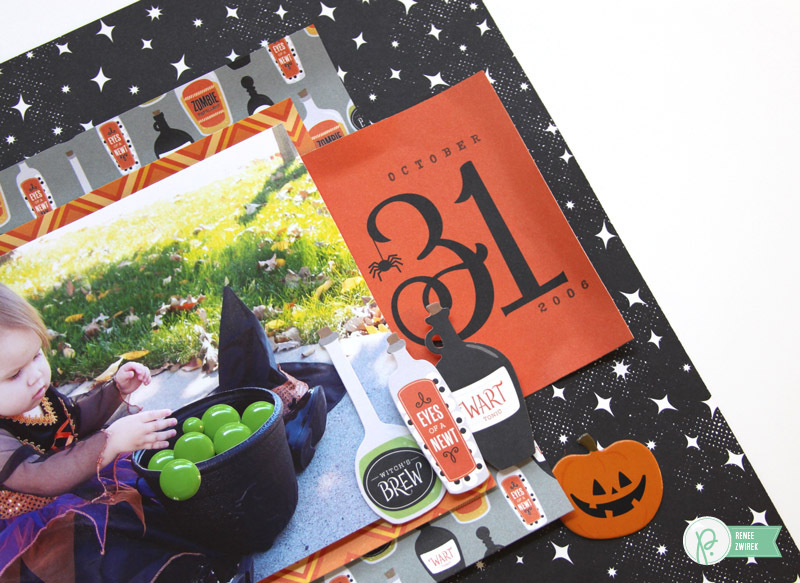 How about this cute Jack-O-Lantern one from our designer Wendy Sue? I love it! 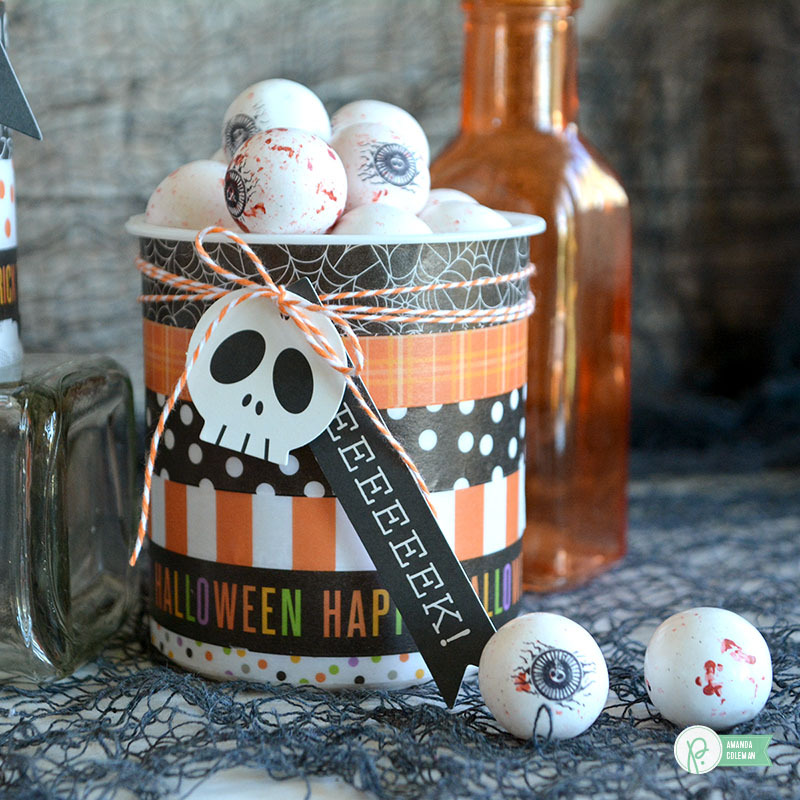 Hey Pebbles friends, Becki here, Halloween is just around the corner. 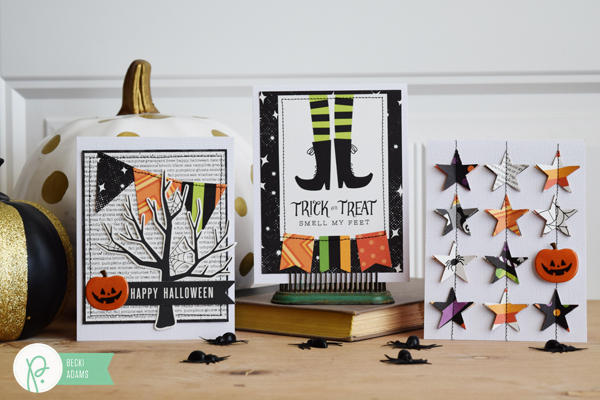 I pulled out some of my favorite punches to create a set of Halloween cards. Of course I used the Boo! collection and some American Crafts punches. 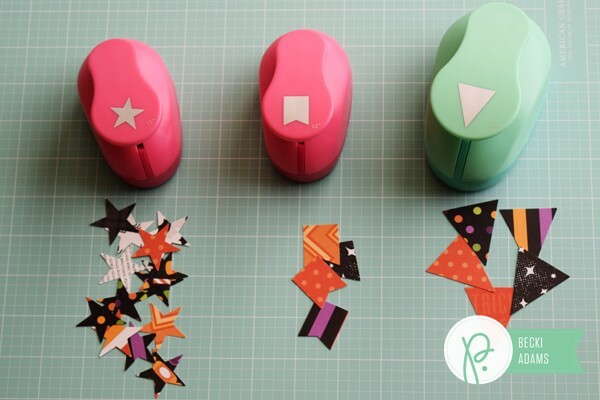 I punched lots of shapes from lots of patterned paper, especially a lot of stars. 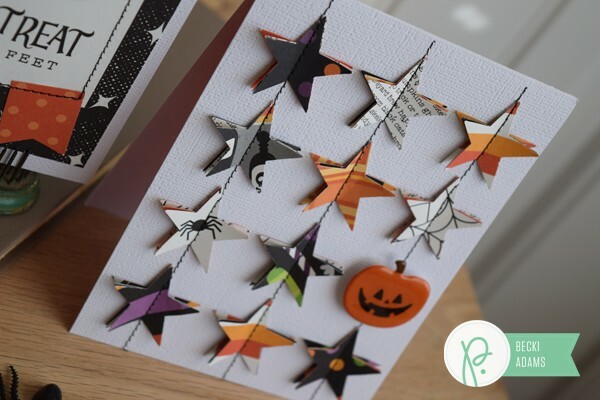 Here’s why I needed lots of stars, there are 3 different patterned paper stars layered and stitched together to create this card. 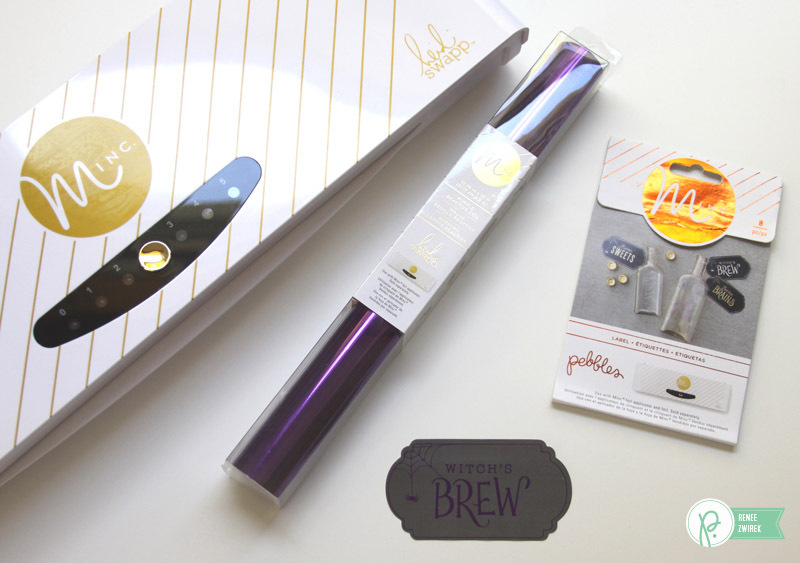 I created a banner with one of the 3×4 journaling cards and the banner shaped punch. The last card I created for this set was with the triangle punch. 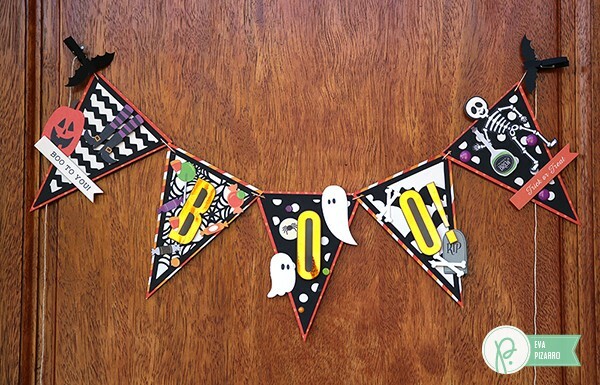 I created a banner at the top of the card and stitched it down with a sewing machine. 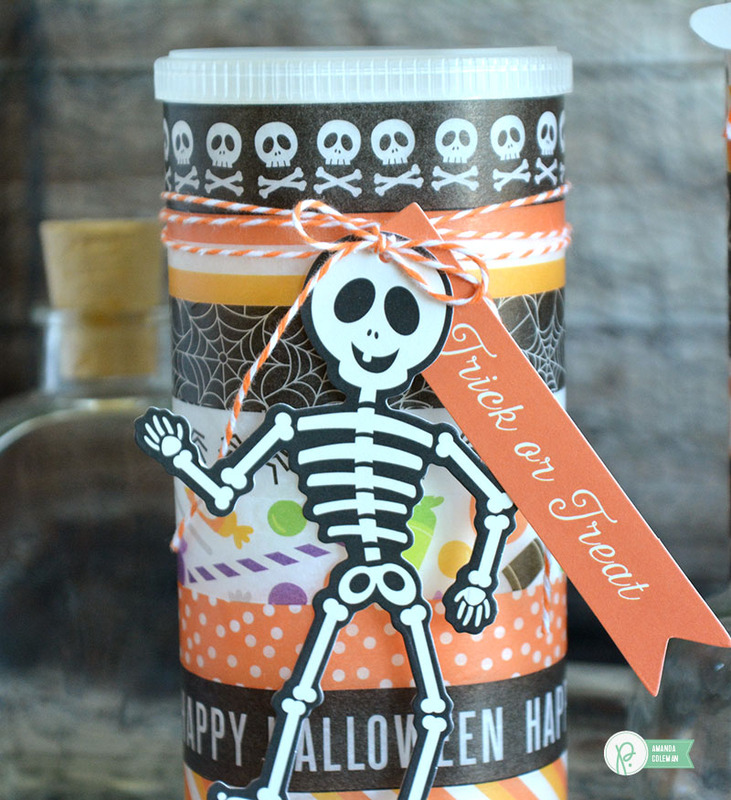 Then, I layered on some die cuts and stickers to create this adorable card. I hope that when these cards land in my nieces mailbox they will put a HUGE smile on their faces. 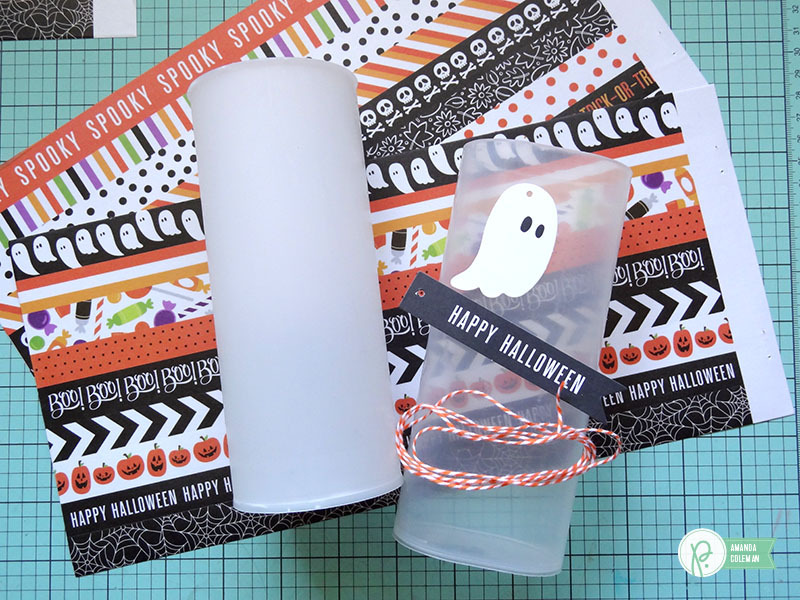 Do you send out Halloween cards? If you haven’t, it may be time to start. 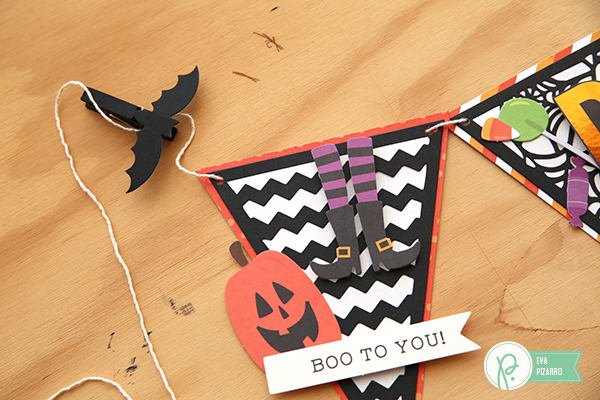 Happy Halloween Pebbles Inc Fans, its Holly here today from Ribbons & Glue! 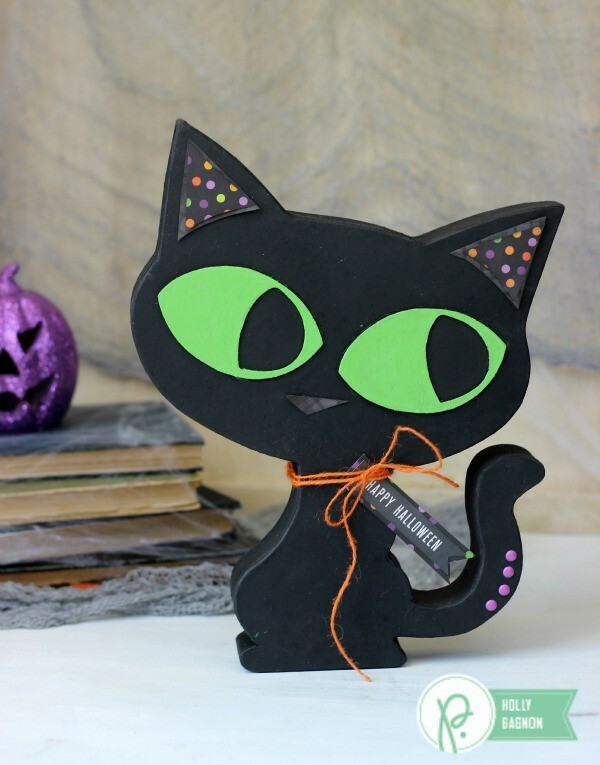 I know it’s not officially Halloween but since Halloween excitement is in the air, I’m sharing a paper mache Halloween Black Cat that I painted and embellished with the Pebbles Inc Boo! collection. 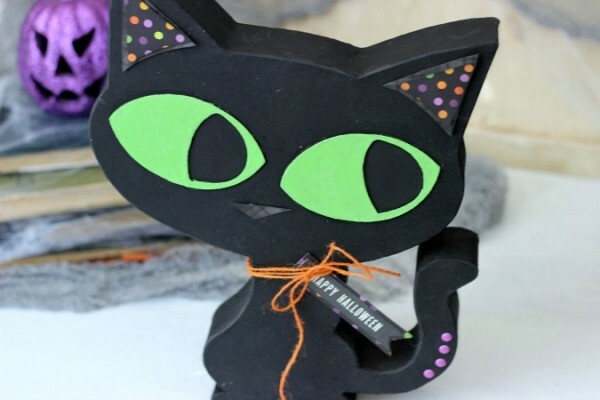 This paper mache cat was something I picked up last year at an after Halloween clearance price. Luckily, I remembered to pull it out of my craft stash this year . 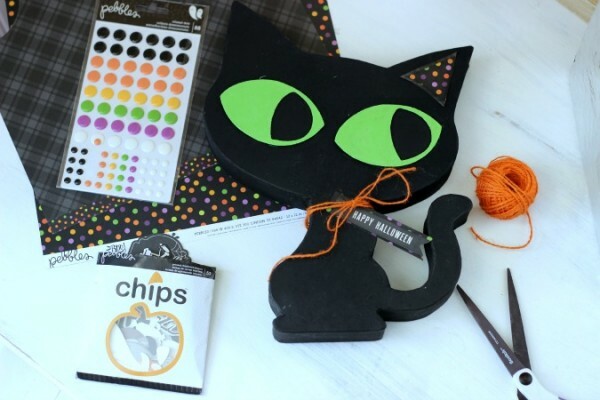 After I painted it black, I felt the cat needed a little more Halloween fun so the embellishments in the Boo! collection did the job. 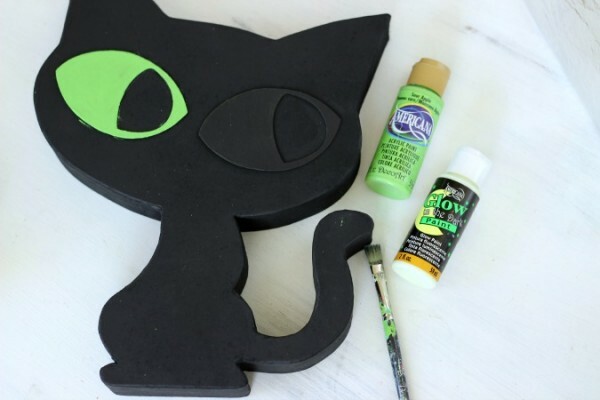 The cat is spray painted black and I painted the eyes with green and glow in the dark paints. I used Boo! 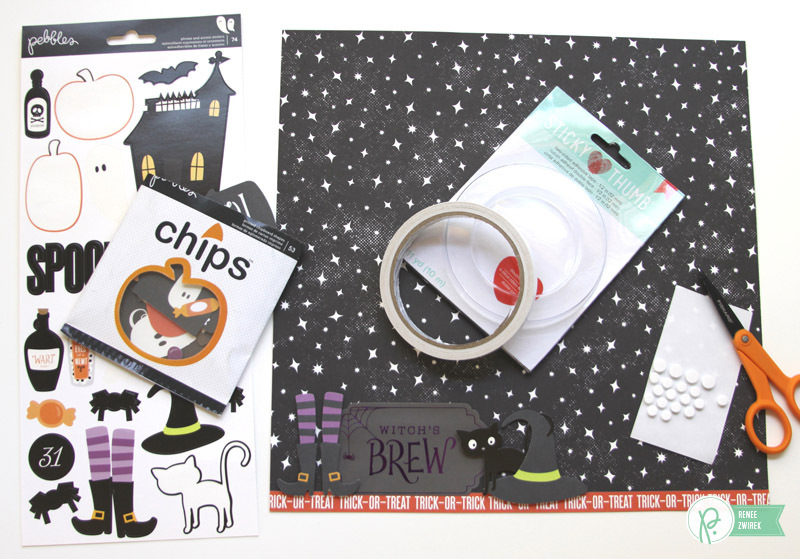 patterned papers, enamel dots, and made a chipboard tag to embellish the cat’s neck. 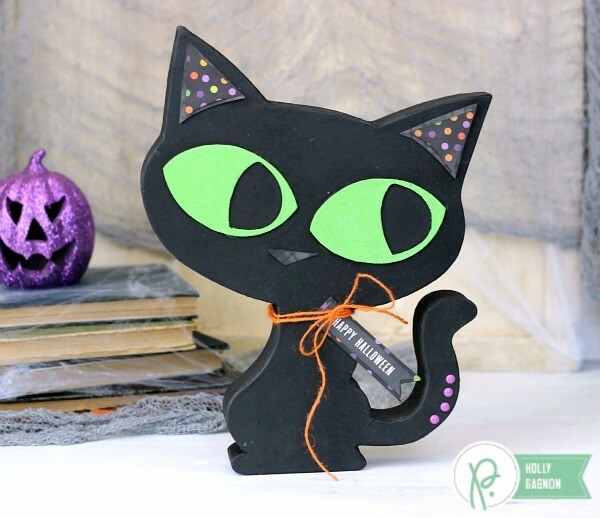 This Halloween Black Cat was such an easy project to embellish with the Pebbles Inc Boo! 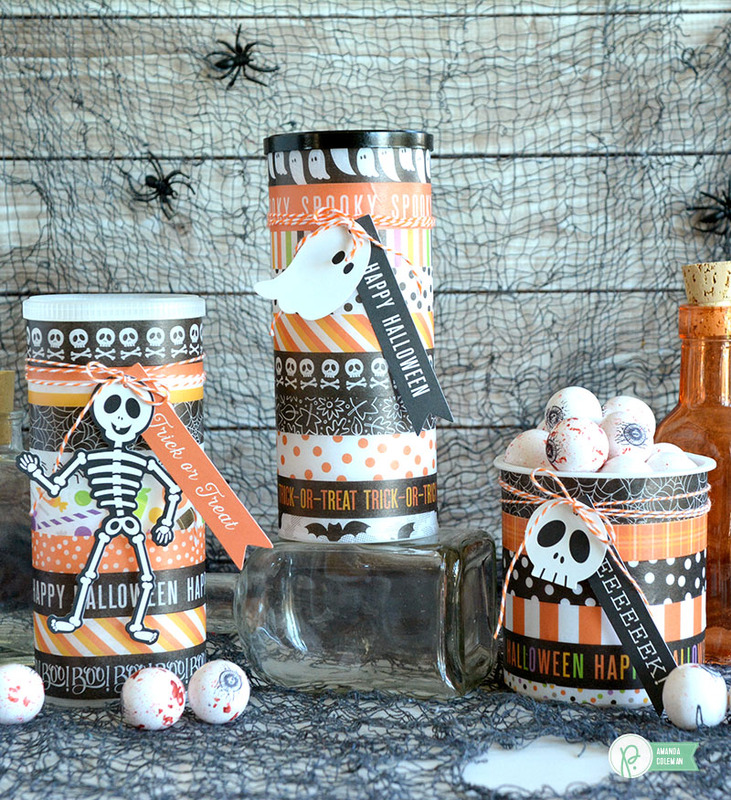 collection and looks great in my Halloween Home Decor too. Hi, Renee here to share a step-by-step tutorial of a Halloween layout I made using the Boo! collection. Let’s time travel together back to Halloween 2006. 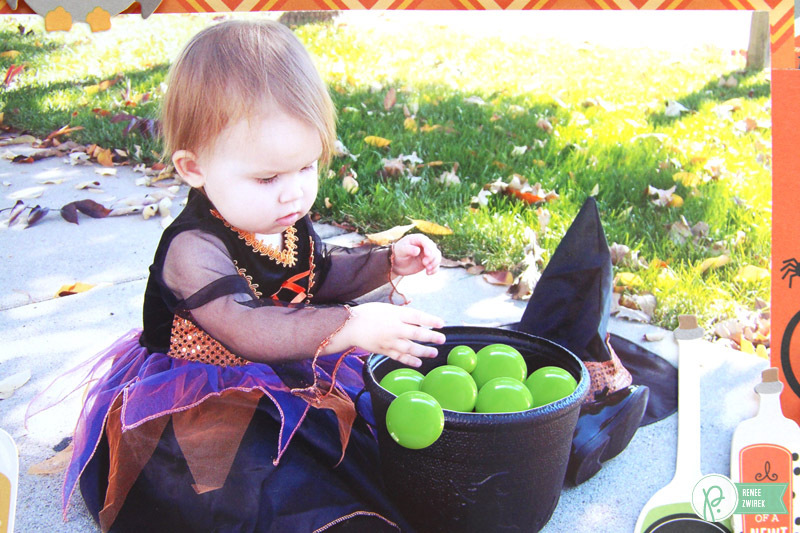 Caitie was dressed up as the cutest little witch and 1½ years old. 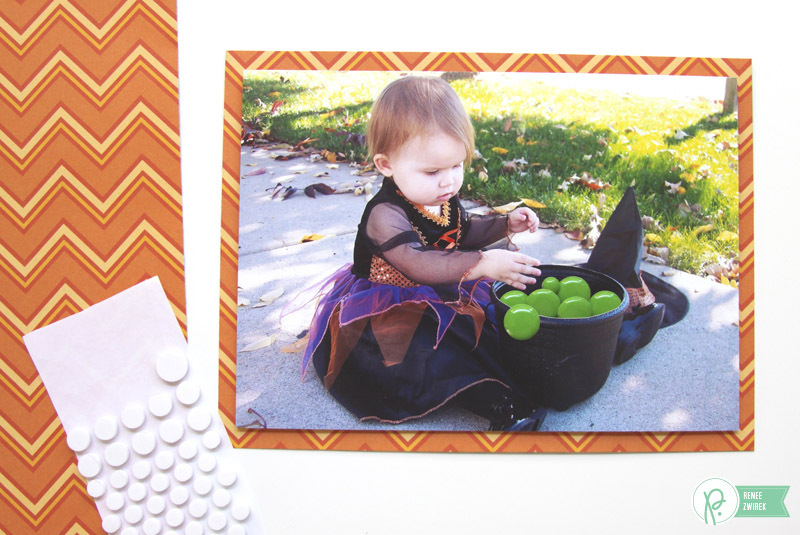 I took her outside for a photoshoot and got some great candid pics of her playing with her cauldron (candy bucket). I chose my favorite photo of her for a Witch’s Brew layout. 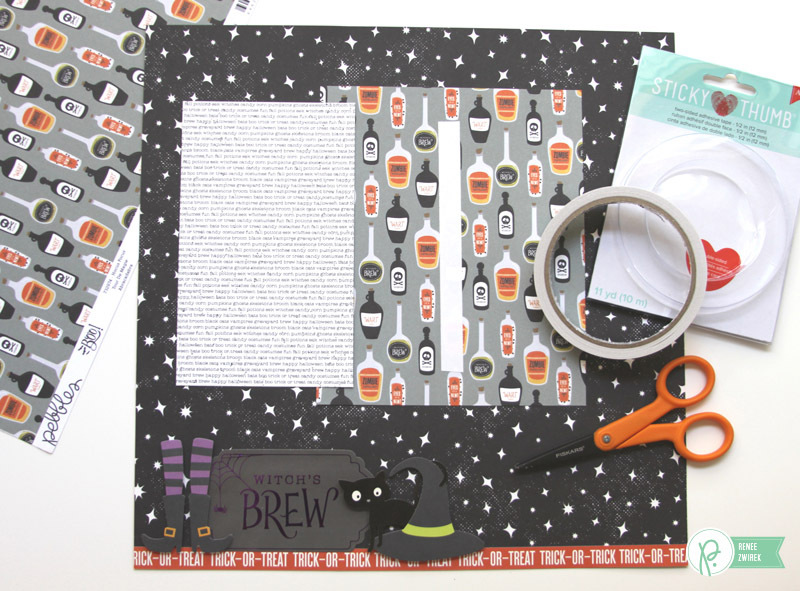 I started this layout with the magical Spooky pattern paper for my background. 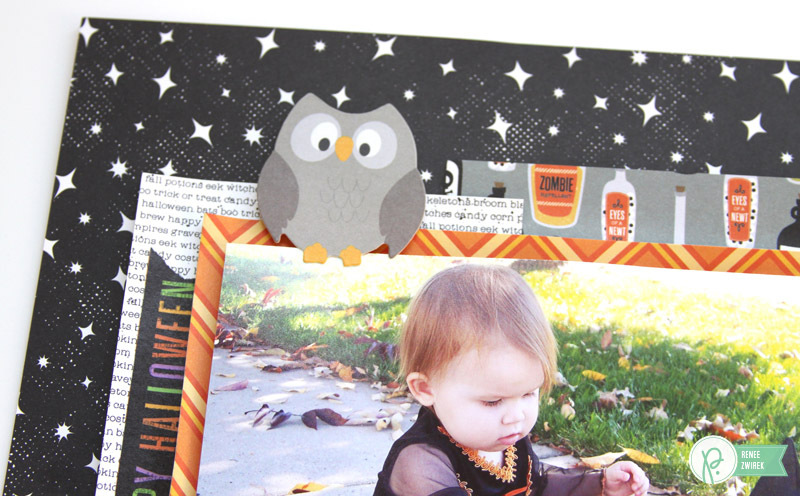 I trimmed off the bottom strip from the Trick-or-Treat pattern paper and adhered it along the bottom of my page. The photo measures 5″ x 7″. 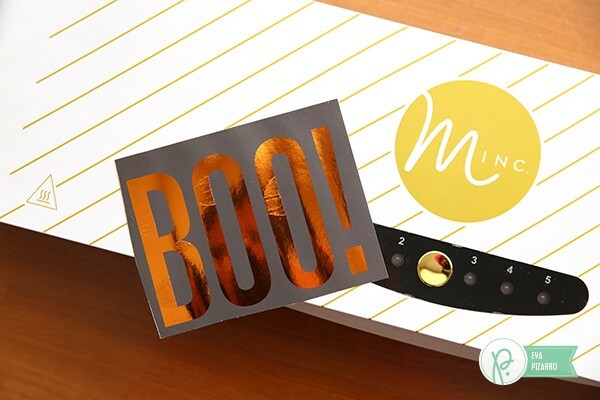 For my title, I used a Minc Halloween Label Sticker and foiled it in Caitie’s favorite color, Purple. Looks great! 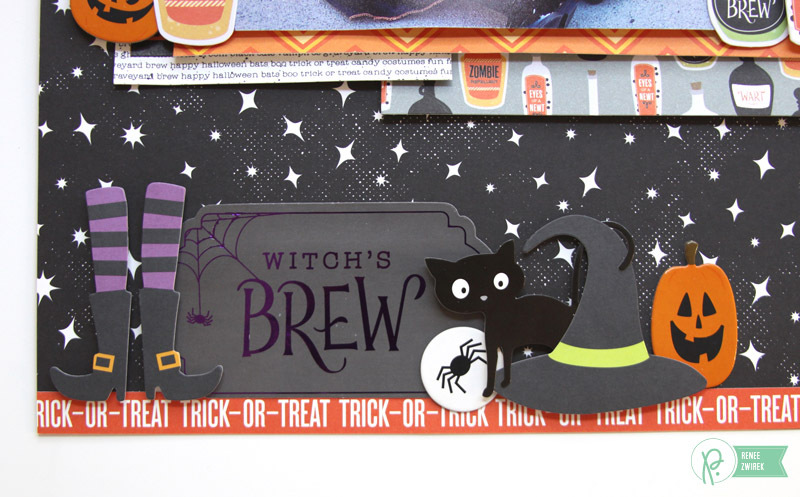 I placed the “Witch’s Brew” title along the bottom strip of my page and added a witch’s hat and feet and an adorable black cat, too. 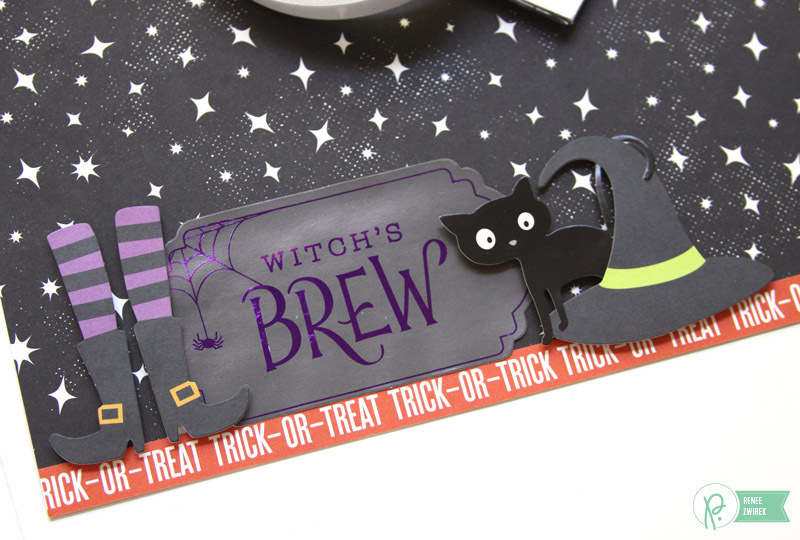 I cut along the cauldron in the photo and added a few Enamel Dots for a fun witch’s brew. I matted my photo with the Candy Corn pattern paper. 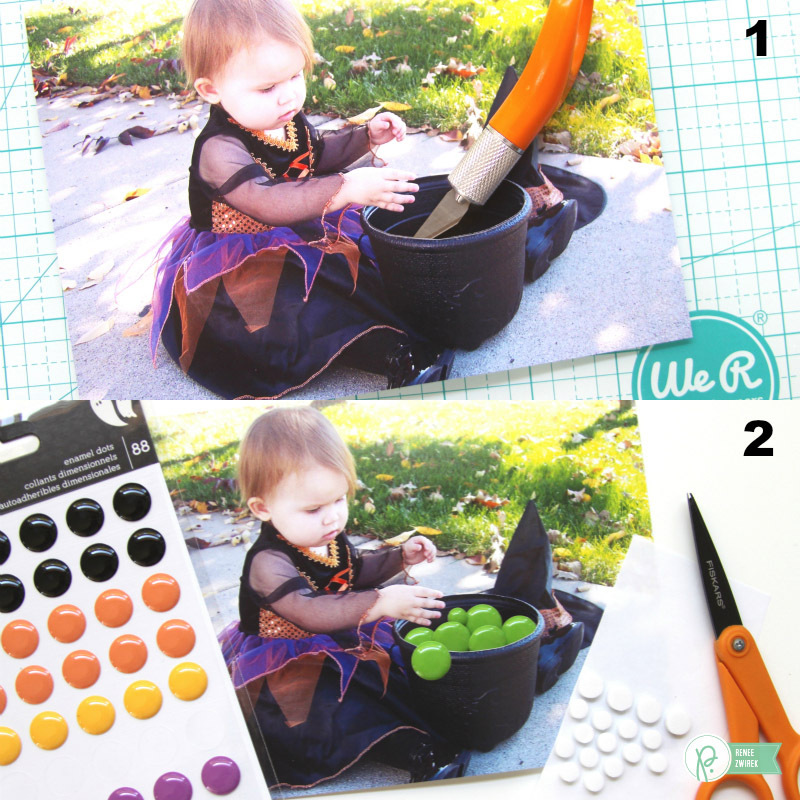 I used both sides of the Hocus Pocus pattern paper to add layers under my photo. These paper pieces measure 3.75″ x 6.25″ and 5.75″ x 7″. 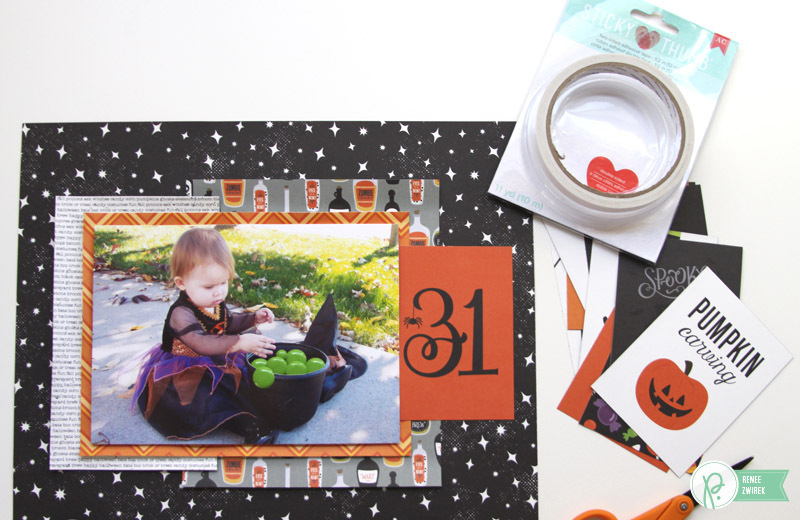 I cut the “31” card from the Happy Halloween pattern paper and added it to my layers. 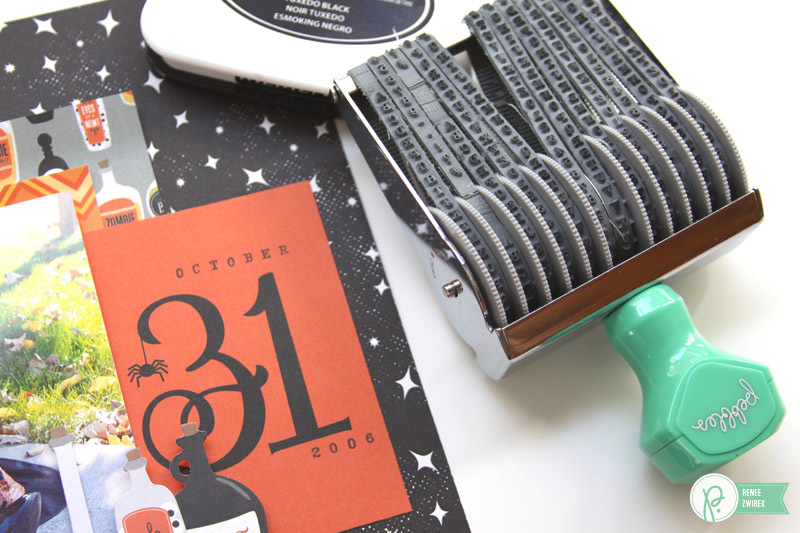 I stamped the date around the “31” card. This Roller Stamp is still one of my favorite tools. 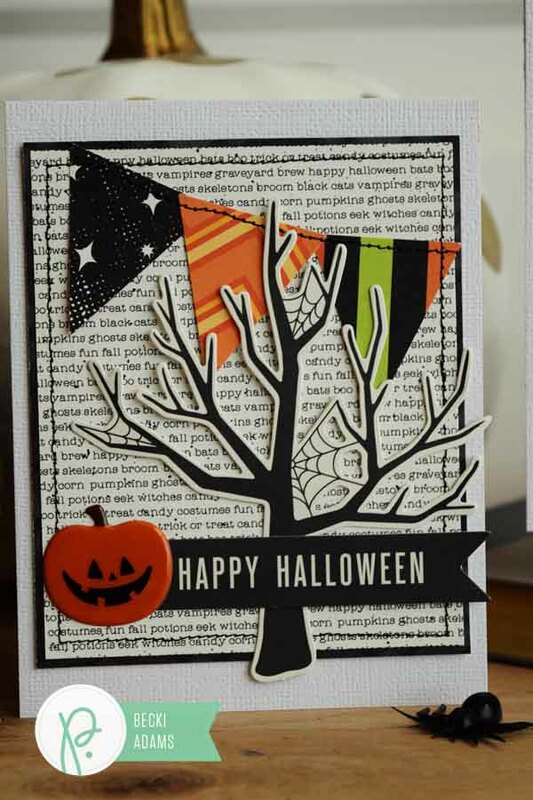 I added a spider, and a few pumpkins around my page. 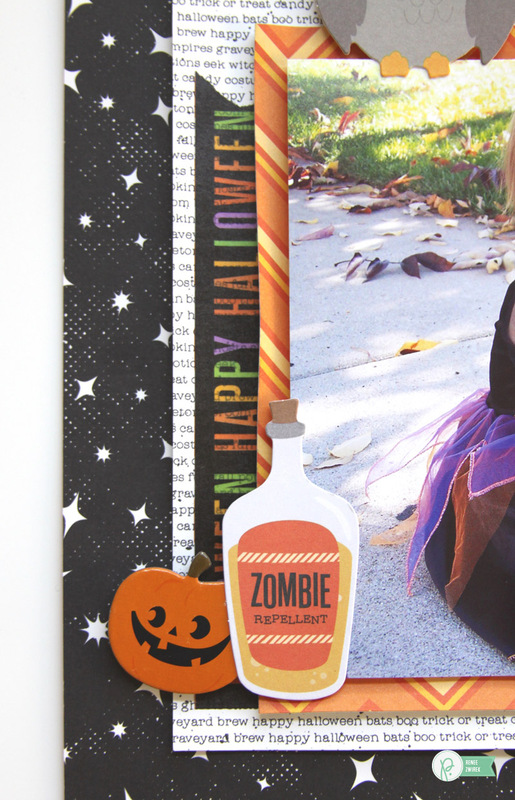 I also added cute potion bottle embellishments next to my photo. 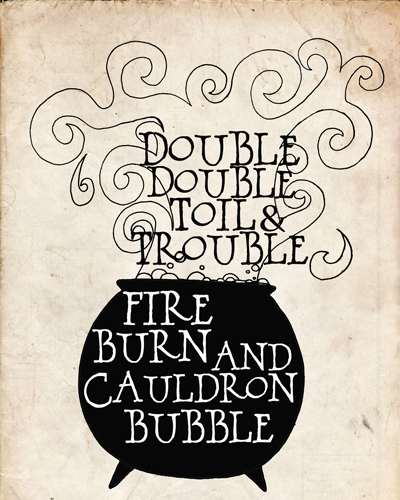 Love the Witch’s Brew effect the Enamel Dots give to the cauldron in this photo! Love this cute little owl! 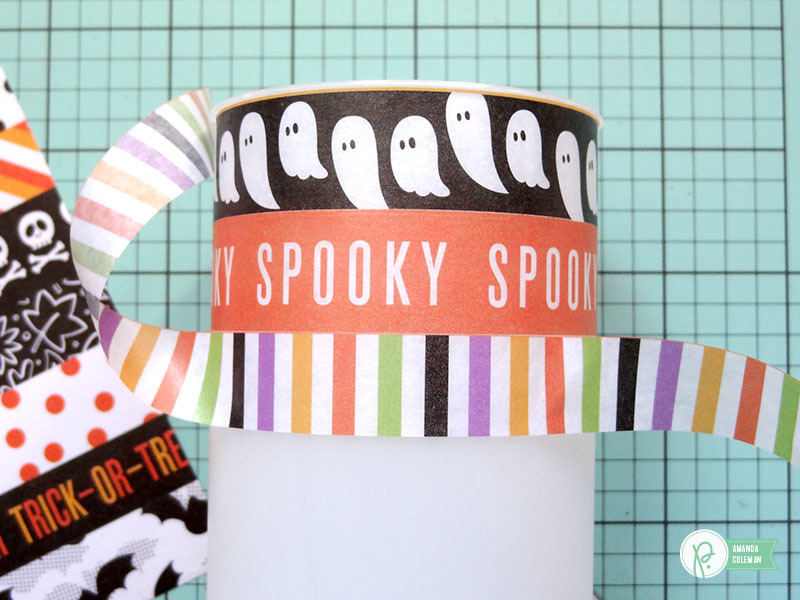 I love the colors in this Washi Paper Tape and love that I can see the cute text from the Hocus Pocus pattern paper show through it a bit.